Miracle tells the story of the 1979 Olympic gold medal-winning U.S. men's hockey team and their startling defeat of the dominant Soviet national team. Please be aware that this is a Disney film and stars Kurt Russell. In spite of all that, there are no Mighty Ducks and no professors wearing tennis shoes. There is, however, large amounts of stars and stripes rah, rah, rah and dogma. Anyone who expects otherwise should have their skates sharpened. 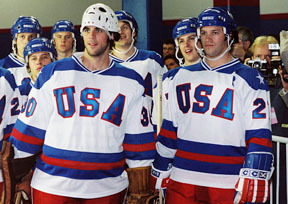 The film's strongest aspect is its portrayal of Herb Brooks, the coach and architect of the young U.S. team. Russell manages to combine intensity with restraint. It's commendable that Miracle doesn't pander by trying to make Brooks likable. For an underdog movie to work (see Breaking Away or Hoosiers), the overachievers can't be strangers. Maybe there are too many players, maybe Russell gets too much screen time, maybe it's the antiseptic quality of the cinematography but at no point did the heroics of the unheralded U.S. team make me want to stand up and cheer. What does make me want to stand up and cheer is good hockey. Miracle does a better job of capturing the speed and casual grace of the game than any other hockey movie I've seen, including The Spinner Spencer Story, King of Hockey and Face Off (not the John Woo one but the Canadian one with Trudy Young). Beyond the team and their games, there is an extremely lame attempt to portray the conflict that Brooks' single-mindedness creates at home. It's almost like they looked at the movie and said, "Hold on, it's all hockey." Patricia Clarkson does an admirable job as Brooks' wife with very little material.